Adjustable support wheels help to avoid excessive wear of steel blades when cleaning on the surfaced roads. The set of the support wheel includes a high-strength rim, air tire and adjusting mechanism. The pressure of the tire has to be 10 bar when working. In the event of sudden change in the air temperature, the tire pressure must be checked again. The spring of wheel mechanism is designed to pull the wheel close to the moldboard in transport position. The tension of the spring can be adjusted. 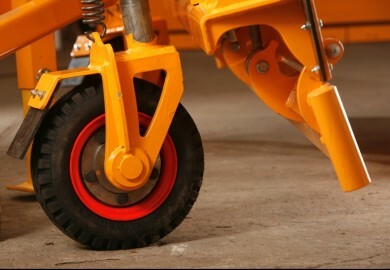 The spring should be adjusted so that the wheel does not come into contact with the vehicle when the plow is lifted. NB! Support wheels cannot be used with an hydraulic additional blade (models LH).